My wife and I always begin Christmas by attending a performance of Handel's Messiah. This Christmas, my son John gave me a new book, Messiah - The Composition and Afterlife of Handel's Masterpiece by Jonathan Keates, which tells two stories about its creation. First, the book reports on the remarkable musical career of George Handel who composed nearly 40 operas, and for 30 years was a dominant figure on London's musical stage. In the 1730's Handel also composed the first oratorios, a lengthy choral work based on Scripture. His first two were Saul and Israel in Egypt. Messiah came next. Oratorios required no staging or acting. They were simply works involving soloists, chorus and orchestra - which made them much less expensive to produce than operas. 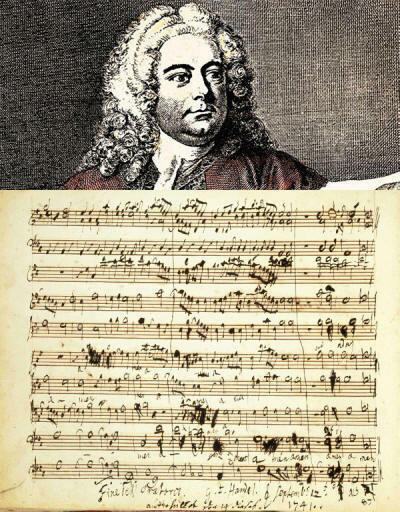 The second major story of Keates' book, Messiah, is about Charles Jennens, a close friend of Handel - who actually chose the Biblical texts to which Handel composed the music. Most people think Handel selected the Scriptural words of Messiah when he only wrote the music. Jennens has been totally forgotten. The Jennens libretto sat on Handel's shelf for three years. However, Handel was invited to Ireland in 1741 for a series of concerts, and decided to compose Messiah for a debut in Ireland. After a disappointing season, Handel was deep in debt. He began composing Messiah on August 22 in his little house in London. Within six days, Part I was complete. In nine more days, he composed Part II; and Part III in only six additional days. He composed a stunning 259 pages of manuscript in three weeks! During those weeks, a waiter prepared food for the composer, but found the bowls and platters remained mostly untouched, day after day. One day he went to Handel's room, and heard him cry out, "I did think I did see all Heaven before me, and the great God Himself." He had just finished writing what became known as "The Hallelujah Chorus." In choosing to perform Messiah for the first time in Dublin - Handel wanted an out-of-town debut, as Broadway shows are often first performed in cities like New Haven. Handel sold out subscriptions in Ireland as he did in London. He was a successful businessman as well as a composer. His audience was almost exclusively from the upper ranks of the community - about 600 leaders who attended nightly for different compositions. Handel donated his fees for Messiah to free 142 men from debtor's prison. Handel was one of the first composers to include drums. And he chose as one of his lead singers of Messiah, Susanna Maria Cibber, who had a scandalous reputation, but a sensational voice. His chorus was composed of singers from two local cathedral choirs. Keates asserts that nothing like Messiah had "had ever been heard before, either in Britain or in continental Europe." Jennens' libretto was written by the son of a family made wealthy by iron manufacturing. Like Handel, he was a lifelong bachelor. A great admirer of Handel, Jennens bought the published texts of every Handel opera. He was thrilled by the opportunity to have his own words for Messiah set to music by his favorite composer. Jennens was a deeply committed Protestant who viewed "Christ the Redeemer, wondrously resurrected form the tomb and promising an equal triumph over death to all who truly acknowledged Him," Keates writes. Part I of Messiah focuses on the prophecies of Isaiah, Haggai and Malachi on the advent of the Messiah, and his effect on humanity: Malachi (3:2) asks, "Who may abide the day of His coming? And who shall stand when He appeareth?" Isaiah 7:14 is sung, "Behold, a virgin shall conceive and bear a son..."
Isaiah 9:2-6 proclaims, "The people that walked in darkness have seen a great light...For unto us a child is born, unto us a son is given, and the government shall be upon His shoulder..."
In Part II Jennens focuses on Christ's Passion, his scourging "wounded for our transgressions," and the agonies of the Crucifixion. Part II ends with the glorious Hallelujah chorus that people have stood up for ever since a king did so: "Hallelujah, for the Lord Omnipotent reigneth" from Revelation 19:6. Surprisingly, that is not the end of Messiah. There is a Part III on the impact of the Resurrection. A duet sings, "O death, where is thy sting?" The chorus concludes, "Worthy is the Lamb that was slain, and hath redeemed us to God by his blood..."
Messiah is a masterpiece that was composed for Easter. No music has ever inspired so many millions over centuries.